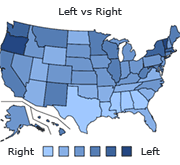 There are many quizzes out there that try to figure out the taker's political ideology. Most are biased, and they mix and match issues. This quiz is strictly on the economy and business, and the questions and answers are as least bias as possible. I intended it for you not to know my fiscal policy opinions until the end. So if you are ready to find the truth on whether you are a capitilist pig or a free loading socialist, take the quiz. Almost all the issues are based on current policies. The quiz is very short and easy, peace. How can the United States improve health care? What do you think of the United States welfare system? Government Welfare should be abolished. Private organizations are more effective. Welfare system is good how it is today. Was FDR a good president? What do you think of the nation's current Minimum Wage laws? What do you think of the Social Security program in the U.S? What do you think of legislation towards making america more fuel efficient? i.e enforcing laws for mandatory higer mpg for car companies. The laws are bad, you cant change or create laws of supply and demand. In general, do U.S companies have too harsh environmental regulations by the U.S government? In general, what is your opinion on labor unions in U.S business and industry? They give workers the rights they need, without them workers would be screwed. Bad for business, therefore bad for the workers. What is your view on the current income tax policy in the United States? Higher taxes on rich to help poor and middle class. Pass higher national sales tax and abolish income tax. Businesses can hire who they want and pay according to their own belief in their employee's work ethic and capablity. Government regulation is fine how it is today. What is your position on our nations public school system? Needs more national government backing to help public schools in poorer areas. What kind of Little are you? Are You a Death Eater?